Check out NJ Sports House amazing new After School Programming MEMBERSHIP. NJSH has now become your one stop shop for all of your academic and athletic needs for after school programs...so just drop them off and let us do the rest! Choose from a variety of programs including The Homework Hour, All Sports, LEGO, and MORE! NJ Sports House has several baseball programs as well as cages to rent year round! NJSH Dance program will be run by the amazing Farrah Corez! Michael was a varsity lacrosse starter at Fair Lawn High School where he received All State and All Gibbs Division Awards. He began his career as an Offensive Coach for the Boys Varsity Lacrosse Team at Don Bosco High School and a year later, became coach for the youth program in Franklin Lakes. This Fall NJ Sports House is Introducing their NEW Girls Field Hockey Program! This program will be providing clinics and weekly training for girls in grades 1-8 and is perfect for both the beginner and advanced player! First Shot Soccer is a recognized leader in the development of youth soccer in northern New Jersey for over 25 years. Phoenix Volleyball NJ is pleased to announce the Volleykids program. 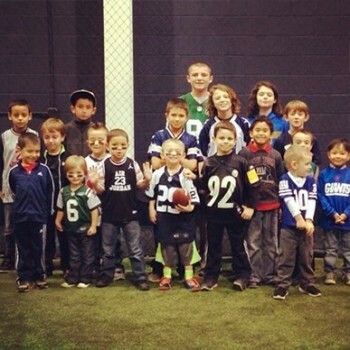 This fall NJ Sports House is happy to announce the start of the NFL Flag Football League for ages 5-13! Leagues will take place on Saturday mornings and will be run by our amazing coaches!!! ALL Academy and Learning Center is now located in NJSH! A Love for Learning is an enrichment center that provides fun and creative classes for students to explore and learn.